Chessington, UK. 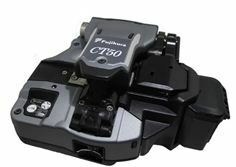 16 May 2018: Leaders in optical connectivity and splicing technology, Fujikura Europe, will be launching the new CT50 Optical Fibre Cleaver, an improved complete cleaving product, offering increased operability and maintainability compared to any other cleaver of its kind on the market today. The CT50 provides enhanced drop and impact resistance and allows customers like never before to replace the actual cleaving blade and resin members that hold the optical fibres, dramatically reducing handling time and maintenance costs. With the ability to cleave single fibres and bundles of up to 12 fibres, the CT50 is Bluetooth enabled, smart phone ready, and can be easily integrated into existing splicing processes for customers looking to invest in a future-proof cleaving solution. Additional features include the ability to intelligently assess and indicate cleaving blade life and the capacity to expand the opening angle of the lever placed on the top of the cleaver able to over 90 degrees, so that optical fibres can be set and removed effortlessly on the cleaving part. The new CT50 will be available worldwide in the summer of 2018.